For ages, mankind has preserved meat by smoking it. And, I guess that’s not the only reason why this act is still practiced today. Smoked meat tends to taste tender and comes with a bunch of delicious flavors. The meat tightly sealed in any smoker becomes an integral part of a family dinner or barbecues. This type of treatment and preservation ensures your meat remain fresh for an extended period. Also, it helps keep the embedded smoky flavor in your meat. This technique can be done anywhere including your homes with an appliance called electric smoker. However, there’s hundreds of this product out there, from good to great, and some come with a hefty price tag. Fortunately, we’ve compiled a list of the top 7 best electric smokers under 200 dollars for people under budget. This electric smoker engineered by Masterbuilt is a 30 inches in height and comes with a powerful 800W heating element. Nevertheless, this product is designed to offer a wide internal cooking space measuring 739 sq. Inches capable of holding 12 whole chicken, four pork butts, 24 burgers, 48 sausages, four racks of ribs, and two whole turkeys. Similar to other smaller models, this product low-power heating element restrict this appliance to not more than 275 degrees. But, with this temperature, you should be able to cook just about any meat. 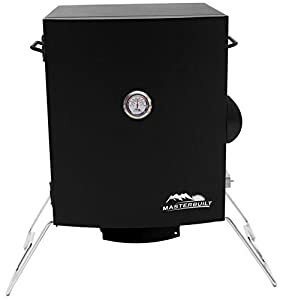 This electric smoker comes with an electronic cooking timer and temperature control, including the Masterbuilt’s side-loading wood chip system that allows users to easily check on the number of wood chips left without any hassle. Sadly, this appliance seems to fall short in terms of consistency. According to many users, it’s heating element takes only a few years of use to burn out, which becomes an issue with the manufacturer’s low warranty not more than 90 days on this unit. While other customers did not experience this issue, it’s a common experience. Thus, you should be aware of this smoker, although it offers excellent values for such low price. 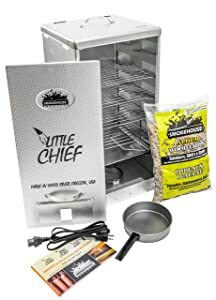 This unit from Smokehouse is a front loading electric smoker coming with an instruction booklet and a bag of wood fuel weight 1.75 pounds with a Chips n’ Chunks hickory flavor. It offers a consistently low temperature about 165 degrees Fahrenheit to ensure your woods are smoked just as you want it not ruining your well earned and expensive batch of sausage or salmon; thanks to its low-profile heating element – 120 Volts, 250 watts. Another incredible feature is its well designed smoke ventilation including proper dehydration and smoke circulation. This ensures that your fish get the right, deep smoke flavor and texture when you are set to get your food out of this unit. Irrespective of what you are willing to smoke, this appliance got you covered with an impressive 25-pound capacity. This smoker is more than capable of holding your batch of elk jerky, fresh catch of salmon and your lovely sausage recipe, which ensures everyone on the table get served and enjoy together. In terms of construction, this smoker is an engineer using robust, sturdy embossed aluminum; thus, making this product not only ideal for outdoor use alone but also durable for long-term use. Lastly, this product comes with both CUL and UL certifications for safety. Plus, a massive 2-year manufacturer warranty to protect customers from manufacturer’s defects. This is one of the exceptionally affordable electric smokers from a well-known manufacturer, Char-Broil. It is a top recommendation for people looking to explore the world of smoking since it comes at an inexpensive price and in a modest size. Let’s get started: this unit features a powerful 1500W burner allowing users to reach a maximum temperature as high 350 degrees, which is more than the recommended temperature for several cooking recipes. In addition, it comes with a generous 1-year warranty, which is a tad long relatively comparing the price. This smoker features an analog dial located at its side for controlling this unit. And, the temperature can be viewed on the front door through a large dial. Sadly, even with double-walled construction, several customers complained of this unit not being able to maintain a temperature between 225 and 250 degrees (temperature range for most recipes) effectively. Reasons are not far fetched. The doors are not secure firmly to the smoker’s base frame. Also, there’s no way to check the amount of wood chip left in the container without opening the door, which is equally responsible for some drop in the smoker’s internal temperature. However, other features made lots of customers more than pleased. To begin with, the three adjustable and removable chrome-plated cooking racks provides users with total control over the layout of the averagely-sized cooking space. More, some users claim that the interaction with the customer service of Char-Broil was tremendous and help resolve issues include temperature related issues, and hold to their one-year warranty. 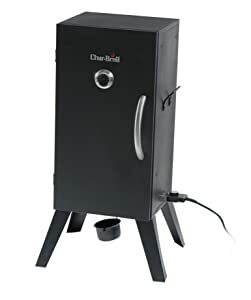 Above all, Char-Broil Vertical Electric Smoker offers a number of beneficial features for such an affordable price and is worth every buck. 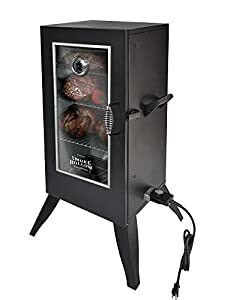 This sturdy unit manufactured by Smoke House comes with a unique feature that makes it different from all of the other model with a price tag less than 200 dollars reviewed on this list. 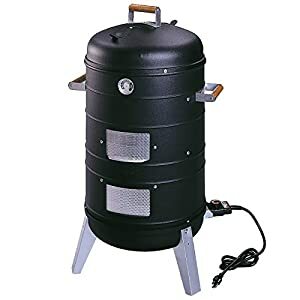 Smoke Hollow 30162EW 30-Inch Electric Smoker with Window comes with a front glass, which means you can watch your meat or fish as it gets cooked, and also, check the amount of wood chip left and water tray without having opened the door. That’s not the best part. This model is capable of keeping a stable temperature. Similarly, this smoker comes with electronic temperature control, just like other models from Masterbuilt, allowing users to choose precisely the cooking temperature and set the right cooking period. These incredible features permit users to sit and get reassured that their food will not get overcooked or burnt. Plus, for less than 200 USD, you get an external-loading wood chip tray meaning you can easily replace the wood chip without opening the door each time you need to. According to several reviews, users are glad about the large chip tray size offering more smoker in the unit while you cook. Unfortunately, this unit comes with small cooking space, only 228 sq. Inches, and just three chrome-plated cooking racks. Although this small-sized smoker is excellent for a small family, using it for smoking meat frequently can be frustrating. The Masterbuilt Outdoor Portable Barbecue Small Electric Meat Smoker Grill is a portable unit designed for on-the-go, outdoor or smoking at home. It’s an excellent choice for road trips, tailgating, camping and also home. No doubt, you should expect this unit to come with excellent compatibility to allow smoking on the go, and, that’s precisely what it offers. Equally, it provides enough room to smoke an entire ham or turkey, your favorite BBQ, or slabs of ribs. That’s not all: it makes use of analog control plus an easy dial temperature settings – off, low, medium, and high. Also, it comes with an easy to read temperature gauge at the front door to avoid your food getting burnt. 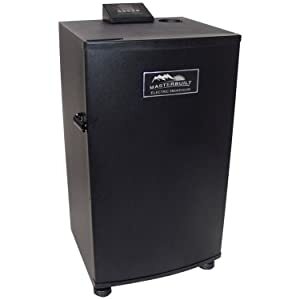 Another inexpensive smoker making our list is Southern Country Smoker 2 in 1 Electric Water Smoker coming with a massive 351 sq. Inches cooking space, built-in temperature gauge, and, two chrome-plated cooking grids. This unit offers new smoke flow constantly for maximum flavor; thanks to its tight-fitting doors that ensure no heat loss. That’s not all: it features an extra-large water pain perfecting the slow-cooking process to make sure your food is tender, yet juice every time. The 1500W heating element is listed on UL and CUL, so you have no troubles plug in this unit to your standard household outlet. 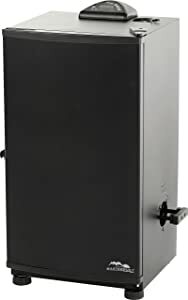 Southern Country Smokers 2 in 1 Electric Water Smoker is designed to allow users add and check the amount of water and wood chips left while they are cooking without hassle – thanks to its heat-resistant wooden hood handle, and sides. Plus, with its interlocking base and hood, you can easily convert this unit into a Lock ‘n’ Go portable electric grill. This smoker comes with four chrome-coated cooking racks and a massive 730 inches of cooking space. Also, it’s powered by electricity, so need for a propane gas consuming the whole space. Here’s more. This unit features a digital panel control, which performs a number of functions such as turning ON/OFF the smoker, setting temperature and time – just to mention a few. The four chrome-plated smoker cooking racks allow you to cook as higher as 80 pounds of food. Plus, it features a patented side loading wood chip without opening the smoker’s door. Eatfrysmith.com is a participant in the Amazon Services LLC Associates Program, an affiliate advertising program designed to provide a means for sites to earn advertising fees by advertising and linking to Amazon.com.